This post will give us some insights on iSER technology which accelerates workloads by using iSCSI extensions for RDMA. the iSER extension has the lowest latency and lowest CPU utilization. It is stable and saves advantages of the iSCSI protocol like security and high availability. The main difference between the standard iSCSI and iSCSI over iSER is the execution of SCSI read/write commands. With iSER the target drives all data transfer (with the exception of iSCSI unsolicited data) by issuing RDMA write/read operations, respectively. iSER is more efficient. The iSER protocol utilizes an existing, compatible iSCSI mechanism (login key negotiation) to determine whether to use iSER or standard iSCSI data transfer models. 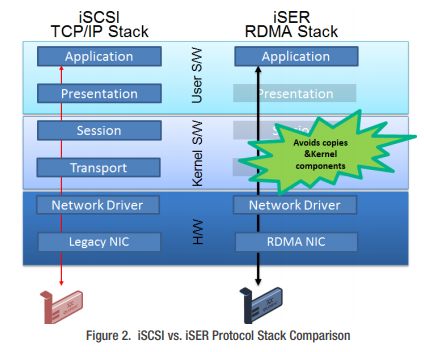 Other aspects of the iSCSI protocol (discovery, boot, security, authentication etc.) are unchanged. Imagine iSER only as a Datamover for the iSCSI protocol. iSER isn’t really new as Wikipedia article has resources dating since 2002.
iSCSI Extensions for RDMA (iSER) is a computer network protocol that extends the Internet Small Computer System Interface (iSCSI) protocol to use Remote Direct Memory Access (RDMA). RDMA is provided by either the Transmission Control Protocol (TCP) with RDMA services (iWARP), RoCE (RDMA over Converged Ethernet) that does not need the TCP layer and therefore provides lower latency, or InfiniBand. 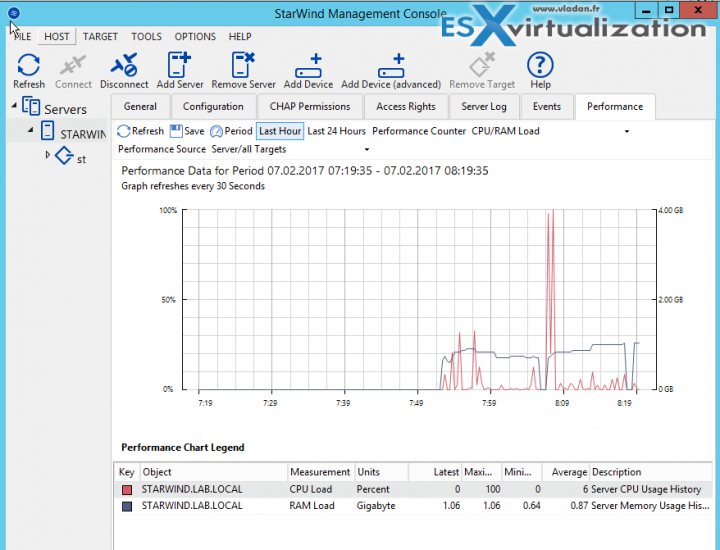 Our readers know StarWind virtual SAN through quite a few articles we have published over the years. An easy to setup flexible product, which provides fast and performant storage for virtual environments. StarWind VSAN supports iSER, which is an extension of data transfer model of iSCSI with RDMA. You might be interested in their latest free offer for 2017 which comes with 30 days trial during which you have the traditional StarWind management console. After that period you can only use a command line or PowerShell, but there aren’t other capacity/CPU limits. Let’s get back to the iSER and the core of this post. iSER is many times faster than iSCSI and easy to manage. With RDMA protocol suite, it supplies higher bandwidth for block storage transfers. It has the lowest latency and lowest CPU utilization. Besides, it is stable and saves advantages of the iSCSI protocol like security and high availability. iSCSI vs iSER protocol stack compare… (Image courtesy of QLogic). I’ll put few quotes from different Internet sources so you can get more idea what iSER is. iSER is an interface that uses Ethernet to carry data directly between server memory and storage devices. The protocol eliminates memory copies (a.k.a. memcpy) and the operating system TCP/IP stack, and bypasses the CPU of the target system entirely. As such, it is lossless, deterministic, with low overhead, and delivers far better CPU efficiency by freeing up resources. Most importantly, iSER uses standard Ethernet switches and comparably priced NICs, which means it’s low cost, yet its performance ratio is far beyond contemporary Ethernet protocols and its throughput approaches wire speed, 40Gbps and even 100Gbps. What are the ISER advantages? – iSER uses the RDMA protocol suite to supply higher bandwidth for block storage transfers (zero time copy behavior). To that fact, it eliminates the TCP/IP processing overhead while preserving the compatibility with iSCSI protocol. In addition, it has the lowest latency and lowest CPU utilization. Moreover, it enjoys the stability and benefits of the iSCSI protocol like security, high availability and so on. Faster than iSCSI, FC, FCoE and easier to manage than SRP. What are the requirements to deploy iSER? Does iSER work only on RDMA hardware? – The iSER protocol has no such constraints. The iSER protocol as defined, should work transparently with either a hardware or software RDMA protocol stack. Note however that an RNIC-based solution (RDMA enabled is likely to yield better performance, assuming typical software processing power. iSER isn’t proprietary of StarWind and has not been invented by StarWind, but StarWind product has a built-in support. Starwind does also storage appliance. Did you know? You can check my article where I report on their storage appliance with storage which has ‘shared nothing’ architecture without shared backplane and which can tolerate 4 disk failures in the group without losing the uptime. It uses distributed RAID61 where other vendors use only RAID6 (2 disk failures). It can expand and scale up or scale out. You can scale up adding individual disks and flash modules, or JBODs, while adding ready controller nodes allows scaling out. For iSER, check StarWind Webinar about iSER. Unlike the previous free version, new VSAN Free delivers unlimited node count, features, and capacity served. It can now be used in any deployment scenario, be it Hyper-Converged, “Compute and Storage Separated”, or even a combination of both. Thanks to multiprotocol support, featuring iSCSI, SMB3, and NFS, including RDMA-capable iSER, NVMf, and SMB Direct, StarWind VSAN easily integrates into any infrastructure, be it virtualized or not. In addition, support for VVOLs, SCVMM, and ready-to-use PowerShell scripts help users to speed up and simplify automated deployment, management, and monitoring of their Virtual SAN infrastructure. 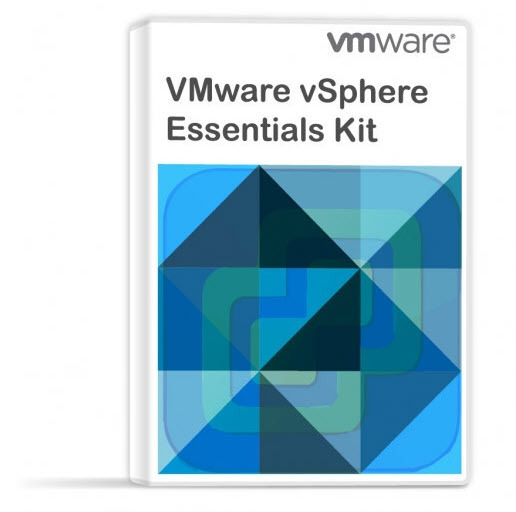 Download your Free 30 days eval copy of StarWind VSAN. Lastly, a very good PDF called iSER RDMA Accelerates Storage, available at QLogic. The paper has some good graphs comparing the traditional iSCSI with iSCSI with iSER. You’ll see the performance benefits, lower CPU utilization or better latency graphs compare there. With iSER based setups, you use the same software as IP based iSCSI. You have the same initiator and target. You just configure the initiator side to use an iSER interface when performing iSCSI discovery. There is nothing new to learn. If your hardware supports iSER, (initiator and target) it will work.